Just a thousand years ago, India was dotted with universities across its length and breadth where international students flocked to gain credentials in advanced education. But in the last 200 years, the connection with age-old knowledge streams has been severely disrupted. In the first part of this new series, Sahana Singh will examine the pedagogy of ancient Indian universities, and in subsequent parts will trace their demise. When Tagore started an open-air school at Shantiniketan in 1901, which later went on to become a famous university, he was one in a long line of educators from India, who believed that holistic learning could only be obtained in the midst of nature under the close supervision of a parent-like guru. India’s earliest teachers were the gurus, who taught in gurukulams and ashrams located far away from the hustle and bustle of towns in what could be called forest universities. It is no surprise that the Vedas, which are the earliest known oral books containing the thoughts of a highly civilised society are replete with exquisite references to nature and the concept of inter-dependence of living organisms. To these gurus, it was important for humans to realise their humble status in the infinite universe before embarking on the long journey of learning. Over time, the systems of transmission of learning to newer generations got institutionalised and gave birth to famous universities such as Takshshila, Nalanda and many famous temple universities of which the remains are still found in southern India. A sizeable number of foreign students came to study in India from China, Korea, Japan, Indonesia and West Asia. While the most famous names are Fa-Hien and Xuanzang, who left behind detailed accounts, there are scores of others, who made difficult journeys by foot and on board the ships just to imbibe knowledge from Indian professors. Many of the foreign students copied texts and commentaries to carry back to their countries. The rush for gaining an education from the Brahmins and Buddhist scholars of India was similar to today’s rush to study in or be certified by American and European universities. There is a curious hesitation among modern historians to refer to India’s multi-disciplinary centres of traditional learning as universities. This comes from the excessive importance given to the written word, to solid buildings with established pedagogy and rigid systems of certification. Thus, the talented, but bare-chested and dhoti-clad engineers and architects of ancient India, who built incredible irrigation canals, rainwater harvesting structures, palaces, forts, roads, dams and aqueducts are barely acknowledged as professionals, who learned from professors in universities. Similarly, the medical practitioners of yore, who knew which combination of herbs could help in healing diseases, where to procure them in forests, how to conduct complex surgeries and who additionally possessed spiritual insights are often regarded as quacks or witch doctors. Ancient Indians were obsessed with gaining perspectives about “the material and the moral, the physical and the spiritual, the perishable and the permanent” (Mookerjee, 1960). During the process of gaining these perspectives, they made important discoveries in the sciences, mathematics and applied medicine. The sacredness of learning is evident from the large number of Sanskrit shlokas that deify the guru such as “Acharya devobhava” (Taittiriya Upanishad). Initiation of children (both male and female) into the alphabets for the first time was done ceremonially in most parts of India. 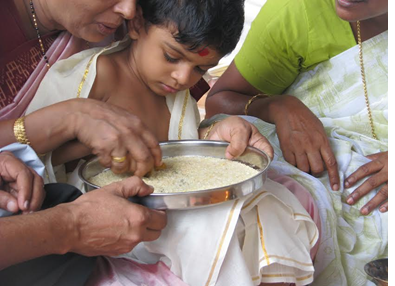 Even today, the ceremony survives in the Haathekhori in Bengal (performed during Saraswati Puja) and the Vidyarambham in Southern India (when children are asked to trace alphabets on rice). The sacred thread ceremony or the Upanayanam ceremony performed for Dwija children between the ages of eight and 12 customarily marked the beginning of education. It was considered terrible to barter knowledge for money. Gurus usually took a token gift (Guru Dakshina) in return for the long years of knowledge they imparted. The Mahabharata gives examples of famous ashramas such as Naimisha, which was a forest university headed by Saunaka. Other hermitages mentioned in the epic are those of Vyasa, Vasishtha and Visvamitra. One hermitage near Kurukshetra even mentions two female rishis. Among Vyasa’s famous disciples were Sumantra, Vaisampayana, Jamini, Paila and Suka (Mookerjee, 1960). Rishi Kanva’s hermitage is not mentioned as a solitary unit, but as an assemblage of numerous hermitages around the central one presided by Rishi Kanva. 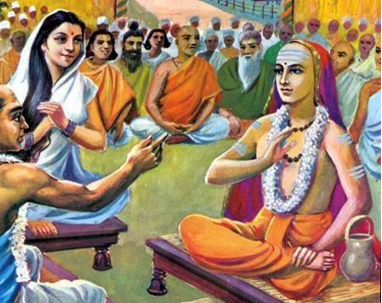 There were specialists in every branch of learning cultivated in that age; in each of the four Vedas; in Yagna-related literature and art; Kalpa-Sutras; in the Chhanda (Metrics), Sabda (or Vyakarana), and Nirukta. There were also Logicians, knowing the principles of Nyaya, and of Dialectics. Specialists in physical sciences and art also taught their skills. The art of constructing altars of various dimensions and shapes for conducting yagna was regarded as significant and this required the teaching of Solid Geometry. There were no artificial demarcations between religion and science and often, one led to the other. Other topics that were taught included properties of matter (dravyaguna) and physical processes. Zoology was also a subject (Mookerjee, 1960). Thus, the forest universities laid out an entire spread of subjects that imparted a holistic view of the world as it was then known. There were a staggering number of universities spread across the length and breadth of India. 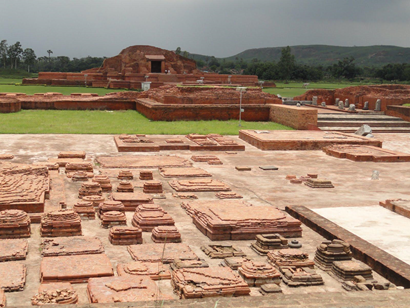 The oldest excavated so far is Takshashila, which is dated to the 6th century BCE, but could be much older. It is located in today’s Pakistan in the Rawalpindi District of Punjab. Others were Nalanda, Valabhi, Vikramshila, Pushpagiri, Jagaddala, Odantapuri, Somapura, Bikrampur, Ratnagiri, Mithila, Ujjaini and Kanchipuram, though this is only a partial list. Even today, archaeologists are coming across the remains of ancient universities close to the already excavated ones. It is possible that both the forest universities and the brick and mortar universities existed side by side. There is an instance of Svetaketu, who is a graduate in the “arts” from Takshashila. He set out to gather practical arts by wandering all over the country, when he came across 500 rishis in a cluster of hermitages, who taught him their arts, texts and practices (Mookerjee, 1960). Traditionally, it is believed that the Mahabharata was first recited at Takshashila by Vaishampayana, student of Vyasa. Takshshila is described as a centre of great learning in the Buddhist Jātaka tales, written around the 5th century CE. The Chinese traveller Fa-Hien mentioned it in his account of his visit to Takshshila in 405 CE. Xuanzang (Hieun Tsang), another Chinese monk, visited Takshshila in 630 and 643CE. The city was overrun by the Huns in 455 CE so it was in ruins by the time Xuanzang visited. Takshashila made great contributions to world culture and Sanskrit language. It is associated with Acharya Chanakya, also known as Kautilya. His famous Arthashastra is said to have been composed in Takshashila itself. The renowned physician Charaka to whom Ayurveda owes a huge debt, also studied at Takshshila. He later became a professor in the same institute. Jivaka, another famous physician and surgeon studied here, according to Pali texts (Mookerjee, 1960). The ancient grammarian Pāṇini, who codified the rules that would define Classical Sanskrit, was also a part of the Takshshila alumni. Clearly, Takshshila produced some formidable scholars. According to the Jatakas, the students went to Takshshila for higher education, and they were trained in the Vedas. Apart from this, there were 18 Sippas or Arts that were taught. The Sippas include scientific and technical education. 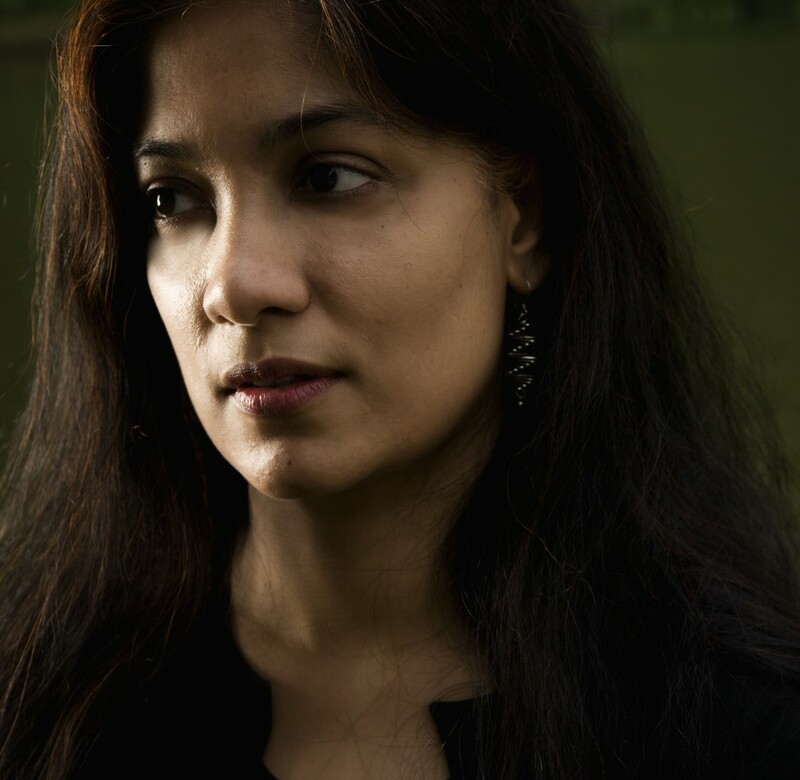 Takshshila also had special schools teaching Medicine, Law and Military Sciences. There was a demand for its archery courses, and there is a mention of 104 princes studying there at the same time. Not everyone came from affluent families (Mookerjee, 1960). It is said that Jivaka, a Takshashila alumnus cured Emperor Bimbisara of fistula and, as a result, was appointed as the physician to the King and to the Buddhist sangha. He is also credited with curing King Pradyota of Ujjaini of jaundice. Jivaka was noted to be a skilled surgeon. A case has been described where a merchant, who was suffering from a head disease, was treated by Jivaka by tying the patient to his bed, cutting through the skin of his head, drawing apart the flesh on each side of the incision, pulling two worms out of the wound, then closing up the sides of the wound, stitching up the skin on the head and anointing it with salve. He is also said to have successfully cured cases of twisted intestines (Mookerjee, 1960). Great store was set by practical training. For example, in medicine, the practical course included a thorough knowledge of medicinal plants. Nature study was considered the best means of awakening a healthy curiosity. Students were required to give a practical demonstration of what they had learned in their colleges. So, Jivika, for example, was cited as having demonstrated his ability to conduct successful surgeries on patients. There is also a mention of a student, who gave a practical demonstration of the technical education he got, in front of his parents, after he returned from Takshshila. Extensive foreign travel was required at the end of the theoretical education in universities. This was specially insisted upon in the case of students from rich families, brought up in luxury, in order to make them experience the hardships of travelling, and to endure heat and cold (Mookerjee, 1960). By far the most detailed description we have is of the Nalanda University in the ancient kingdom of Magadha thanks to the writings (seventh century CE) of Chinese travellers Xuanzang and Yijing. Students flocked from near and far to learn from the acclaimed teachers at the university and some came all the way from Tibet, China, Korea and Central Asia. It was not easy to gain admission into Nalanda University (just as in an earlier era, it was not easy to be accepted as pupils by renowned gurus). From the accounts of Xuanzang, it appears that Nalanda had a very tough entrance examination. Only about 20% of the students, who applied, seem to have got through it. And yet, the university had as many as 8,500 students and 1,500 teachers (Mookerjee, 1960). There was even a network of schools that helped students prepare for getting into Nalanda, which sounds uncannily similar to today’s coaching centres for IIT-JEE and other competitive examinations. The students of Nalanda were looked up to as models all over India and were highly respected, according to Xuanzang. Taking advantage of this, some people even faked their Nalanda degrees! 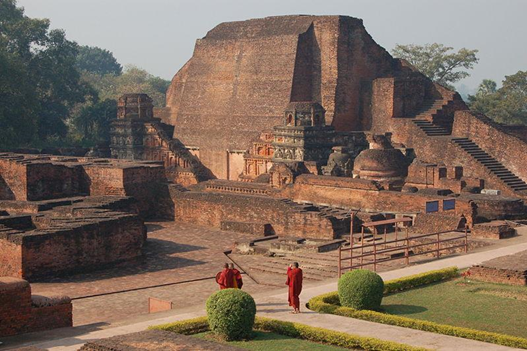 By the seventh century, there were four other universities in Bihar, all largely inspired by Nalanda. They worked in collaboration, and by the tenth century, one of them—Vikramshila—emerged as a serious competitor to Nalanda in higher education. A wide range of subjects were taught in Nalanda; sacred and secular, philosophical and practical, sciences and arts; it was the most complete education available at that time, says Xuanzang, who studied there for five years. He studied Yoga shastra under the highest authority of the time – Silabhadra. He also studied Nyaya, Hetuvidya, Shabdavidya and the Sanskrit grammar of Panini. There is an interesting side story to this. Xuanzang has written that, when he visited Kanchi, he met a number of monks from Ceylon. When he told them about his impending visit to Ceylon, they said it was futile because he would not meet anyone superior to them in knowledge. Intrigued, Xuanzang began to discuss yoga texts with them. To his disappointment, he found their explanations not as good as the one he got from Professor Silabhadra in Nalanda University (Mookerjee, 1960). Nalanda mainly flourished under the patronage of the Gupta Empire as well as emperors such as Harsha and later, the rulers of the Pala Empire. Various endowments were made by the kings, which led to the construction of impressive buildings, majestic in their size with richly adorned towers and turrets that gave the look of hill-tops, and observatories that were covered by mist in the mornings. According to Xuanzang, there was a lofty wall all around the grounds and a big gate, which opened into the university with a big main hall from which was separated eight other halls. He describes that the upper rooms towered above the clouds and from their windows, one could see the wind and clouds producing new forms, and from the soaring eaves (overhang from the roof), splendid sunsets and moonlit glories could be seen. A similar description is given in the Nalanda Stone Inscription of Yasovarman of the 8th century stating that the rows of monasteries had their series of summits (shikhara-shreni) licking the clouds (ambudhara). The grounds had deep, translucent ponds bearing blue lotuses interspersed with the deep red Kanaka flower, while Amra groves spread their shade all around. The massive external grandeur of the buildings is said to have contrasted with the delicate artistic beauty of the interior (Mookerjee, 1960). Logic and debate were extremely significant for India’s philosophical traditions. This love for debate and presentation of arguments from ancient times formed the root of democracy, which has endured even today right down to the village level. The debates we see on TV channels and legislative bodies are a part of a continuum, albeit in a degraded form going back to a hoary past. References to Tarka-Vidya, the science and art of logic and debate and Vaada-Vidya, the art of discussion can be found in innumerable ancient texts such as Ramayana, Manusamhita, Mahabharata, Skandapurana, Yajnavalkya Samhita, and Chandogya Upanishad, to name just a few. The terminology of debate was well-developed. To give a flavour of the terms, consider saadhya (thesis which is to be established), siddhanta (proposition, tenet or conclusion), hetu (reason), udhaarana (example), saadharmya (affirmative example), vaidharmya (negative example), pratyaksha (perception), anumaana (inference) and pramaanaa (proof). In his book on Indian logic, Satish Chandra Vidyabhusana refers to Maitreya, an eminent teacher, also called Mirok in Chinese, who lived 900 years after the nirvana of Buddha. He wrote a treatise on debate in which, he postulated that the subject of debate should be a useful, not an irrelevant one. Further, he said debate should not be entered into in any place but in the presence of scholars or in a parishad (council). Maitreya laid out the rules by which a candidate’s victory or loss could be decided in a debate. He stressed that debaters should be well-versed in each other’s scriptures, must never discard dignity and use disrespectful language, must be fearless, must speak continuously and intelligibly, and with voice-variation, that is sometimes slowly and sometimes loudly. Is it not amazing that even today, these are the skills taught to public speakers and debaters? According to Xuanzang the monks at Nalanda frequently assembled for discussions to test intellectual capacity. Those who were able to put forward finer points in philosophy, who could give subtle principles their proper place and who were ornate in diction, were rewarded. These universities played a big role in nourishing the spirit of open debate in ancient India. Yijing, another Chinese traveller to India, who came after Xuanzang mentions that kings were fond of organising intellectual tournaments in which people with superior knowledge and debating skills were richly rewarded (Mookerjee, 1960). Nalanda had a famous, well-equipped library with many rare manuscripts. According to Yijing, the library had three huge buildings called Ratnasagara, Ratnadadhi and Ratnaranjaka of which Ratnasagara was a nine-storeyed building that stored rare sacred works such as Prajna Paramita Sutra. Today, we marvel at the imposing libraries housed in Ivy League universities. Throw back your imagination to a time when such libraries were a part of Indian tradition. Among the competitors of Nalanda was Valabhi University in Gujarat, which was famous for its teaching of secular subjects. Students went to study there from all over the country. Some of them got high government positions on graduating. Vikramshila University was built by King Dharmapala in the 8th century, again a rival of Nalanda, but it also collaborated with it. The alumni of this university is said to have practically built the culture and civilization of Tibet. The most important of them is Dipankara Sri Jnana. Then there was Mithila, which specialised in logic and scientific subjects. According to historian Keay, it was so strict in guarding its knowledge that students were not allowed to take any books outside or even copies of lectures. They could only leave with their diplomas or degrees (Vidyabhusana, 1920). The monopoly of Mithila University was broken by the Nadia University, which also specialised in logic. The story goes that Vasudeva Sarvabhauma in the 15th century, studied in Mithila University, but when he was prevented from copying the texts, he committed to memory, the whole of Tattva Chintamani and the metrical part of Kusumanjali. Then, in Nadia, he wrote down the texts he had memorised and founded a new academy of logic. Nadia soon outrivaled Mithila by producing better scholars (Mookerjee, 1960). One university that simply stands out for its academic output in astronomy and mathematics is Ujjaini (also called Ujjain), which was equipped with an elaborate observatory and stood on the zero meridian of longitude of those times (Raju, 2007). Had imperialistic Europe not assumed control of the scientific discourse of the world, perhaps Ujjain, not Greenwich would have been today’s prime meridian. Brahmagupta was among the most celebrated astronomers of Ujjaini University, who continued the tradition of Varahamihira and made significant contributions to mathematics. He worked on trigonometrical formulae, quadratic equations, area of cyclic quadrilateral, arithmetic progression and improved Aryabhata’s sine tables. In his treatise Brahmasphutasiddhanta, he was the first to treat zero as a number in its own right, rather than as simply a placeholder digit. He established basic mathematical rules for dealing with zero such as 1 + 0 = 1; 1 – 0 = 1; and 1 x 0 = 0 (B.S.Yadav, 2011). Brahmagupta’s works reached the court of Khalifa al-Mansur in Baghdad and played a path breaking role in making the Arabs conversant with Indian astronomy and mathematics. Later, this knowledge was transmitted to Europe. The tradition of Brahmagupta was continued by Bhaskara II, also called Bhaskaracharya, who became the head of the astronomical observatory at Ujjaini. He wrote the famous Siddhantasiromani and Lilavati. In the New World Encyclopedia, J. J. O’Connor and E. F. Robertson are quoted to have said in their paper for the School of Mathematics and Statistics that Bhaskaracharya “reached an understanding of the number systems and solving equations, which was not to be achieved in Europe for several centuries.” He was said to be the first mathematician to write a work with full and systematic use of the decimal number system. Bhaskaracharya is also considered as the founder of differential calculus, who applied it centuries before Newton and Leibniz. He too had a profound impact on Islamic mathematicians just like the earlier acharyas of Ujjaini. In the next part, we will examine the role of temple universities in southern India, the role of Indian scholars in influencing global streams of knowledge and the weakening of India’s education fabric during colonial rule. The author would like to acknowledge the inputs of the members of Indian History Awareness and Research (IHAR) and would like to specially thank Jyoti Gangopadhyay for her support.